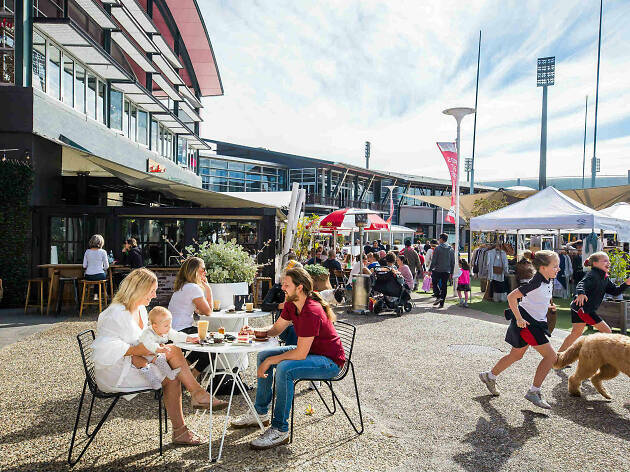 With daily attractions, special events, and premium eating and drinking venues, the Entertainment Quarter has never been so, well, entertaining. Here’s a rundown of highlights these summer holidays – enough to fill a full day and more. As a bonus, visitors can enjoy two hours of free parking on site (terms and conditions apply). If you love the outdoor cinema events that Sydney does so well then you need to try Mov’in Bed Outdor Bed Cinema (until Feb 17) – a season of great movies that you enjoy lying on a double bed in the Showring. WaterWorld Central (Dec 28-Jan 28, closed Jan 1), Australia’s first mobile water park, is making a splash at the EQ this summer; kids 16 years and under can thrill to a series of inflatable water slides. 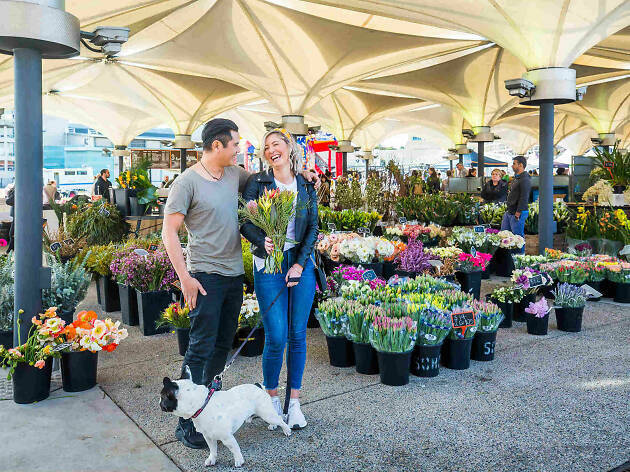 Celebrating cruelty-free living, Sydney Vegan Markets welcome stalls by vegan businesses on the third Sunday of every month (Dec 16, Jan 20 & Feb 17). The world's first Brickman Cities powered by LEGO® City runs from Jan 4-Feb 10. See time stand still in 1923, explore the world’s greatest cities, and build your own with millions of LEGO® bricks. 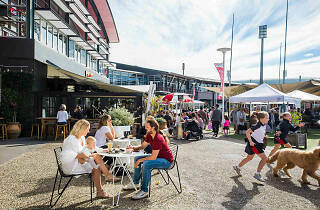 There’s a whole lot of fun for all ages happening at the Entertainment Quarter every day. Perhaps you’d like to catch a movie at the two Hoyts Cinemas – including an IMAX screen and a Hoyts LUX cinema and bar. More active pursuits can be enjoyed at Strike Bowling, such as Laser Tag, Karaoke and an Escape Room challenge as well as the tenpin variety. Craving the powder? Off-Piste Ski and Snowboard Simulators are a way to keep your skiiing skills up over summer with the help of HD panoramic screens and convincing vibration effects. For the kids, there’s Flymotion – a trampoline bungee that allows leaps of up to seven metres in the air; Monkey Mania Indoor Play Centre and Kids’ Party Venue, with jumping castle, toddlers’ area, a gun/cannon foam ball arena, climbing structure and slides; and Plaster Funtime, a craft workshop where kids and adults can paint plaster objects. The Impact Wall virtual reality arcade, with large-screen interactive games, is great for kids’ parties, and for fans of all things on wheels, Skater HQ is a where you can buy skateboards, cooters, skates, protective gear and more, offering lessons for kids on Saturdays. 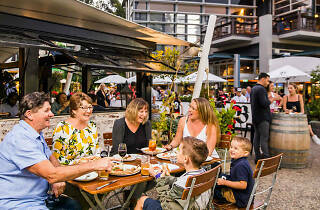 You’ll never go hungry at the Entertainment Quarter. Get a hearty breakfast at Jamaica Blue Café and a heart-starting coffee and tempting patisserie treat from Blackstar Pastry. At dinnertime, Backyard Burger Kitchen is flipping American-style burgers, cheesy fries and sundaes, and BlackBear BBQ is doing authentic woodsmoked American-style barbecued meats. Pasta masters Fratelli Fresh can cook you up a bowl of something just like Nonna made. The hearty flavours of Germany are available at the Bavarian – pretzels, pork knuckles, sausages and schnitzels – not to mention beer by the stein. And Masala Kitchen offers the best of modern Indian cuisine served up in unique surroundings. After dinner, why not kick on for an ale at PJ Gallagher’s Irish Pub? 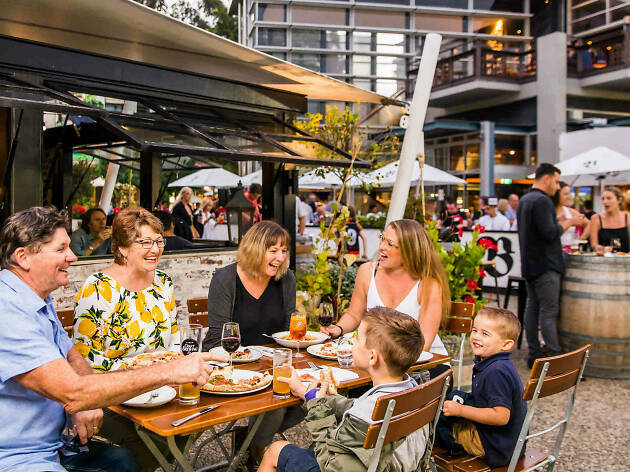 If the fruit of the vine is more your tipple then the Urban Winery Sydney is a cellar door and wine bar celebrating the wines of New South Wales – along with NSW spirits, cheeses, olives and more. And if you feel like ending the evening with a laugh the Comedy Store is where you can catch a showcase of up to eight comedians or a headline show by a well known star of stand-up.